When it comes to finding the best girls remote control car, there are a lot of options available. This also means that there are more elements to take into consideration before making a purchase. To ensure you pick the best possible RC car for your little girl, you’ll want to check out our review of the 16 best choices that are on the market, right now. To make the buying process even more effortless, a guide is available at the end which includes more information about the main factors to consider, as well as some of the developmental benefits that you may not be expecting to find. By the end, you’ll have all the info you need to choose the best RC car for your girl. This GIRLMAZING Big Foot Jeep RC vehicle toy by Jada Toys comes with a radio control that provides your child with complete control. We liked how your little girl is also given the option to decorate their RC vehicle. This is because the toy comes with an awesome set of Glamour Deco Stickers. Young kids love using these to get creative and add some of their own personality to the jeep toy. This is also a fantastic way to stimulate your child’s imaginative side. In addition to the stickers, the design of the vehicle toy itself is very bright and colorful. As a result, it gives off a fun impression that encourages kids to play creatively with it. The stickers that are available with this set are fantastic for encouraging kids to add their personality to the toy vehicle. Kids are also given the option to move the car toy backward and forwards too. We liked how they’ve designed the remote control with just one frequency channel. This means that there’s a smaller chance of interference between the control and the toy. As a result, it’s incredibly responsive. Children have been loving how this one comes with their favorite Disney character in the driver’s seat too. Kids have been having a blast using the spinning control with this RC toy car. Moreover, they’re encouraged to play more creatively because of the Minnie Mouse character in the front seat. 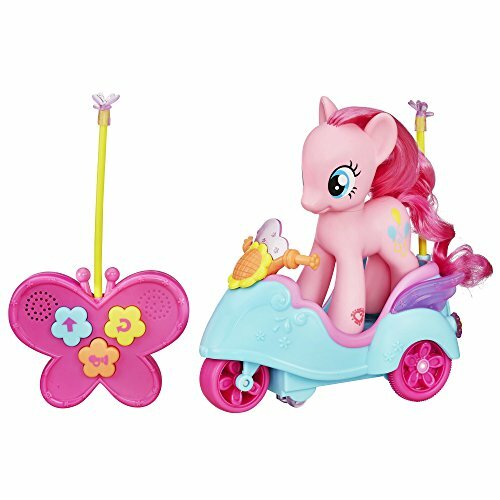 This My Little Pony Pinkie Pie RC toy comes with a Pinkie Pie toy that goes on top of the scooter. Kids who are fans of My Little Pony have been impressed with the design of the figure. It’s also a fantastic way to help them play with more imagination. It’s another RC toy that has an excellent spinning movement available. Girls are overjoyed with how much fun they can have controlling the Pinkie Pie character in awesome 360-degree spinning motions. You can also move the toy in forwards motions too. There are also instructions included to ensure your child is able to get the hang of the controls in no time. With the 360-degree spinning motion, you can be sure that your child can have tons of fun with their favorite My Little Pony character for hours. Toy State’s Nikko RC Barbie Convertible Vehicle is a fantastic option if your little girl is a fan of Barbies. Little girls who already have a collection of Barbie dolls can use this RC car toy as an extension of their toy collection. This is because it can fit all Barbie dolls. This is an impressive feature that girls have been having a lot of fun with. We liked how they’ve created the remote control with a joystick design. It’s super easy to use and get to grips with. The simpler back and forth function may be more suitable for younger children. Moreover, the detail on the inside of this convertible RC car is incredible. This adds to the whole experience and ensures children are able to play with as much creativity as possible. 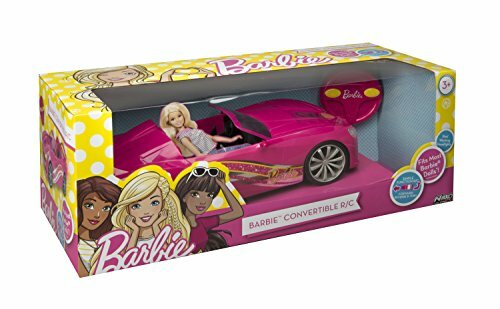 Girls who have a collection of Barbie dolls will be able to put any one of them inside this convertible RC car toy. This is an excellent feature that helps to broaden your child’s creative play abilities. Kids Galaxy’s My First RC Baja Buggy is a fantastic choice for toddlers. This is because the controls are very easy to use and they help to develop your child’s motor skills. This toy has also won awards for being among the most engaging and innovative toy of the year! The design of the remote control has been made to look like a steering wheel. We found it to be the perfect size for your little girl’s hands. It ensures that they have complete control over the buggy with no issues. There’s even a button which they can press to make the toy spin which is a ton of fun. Another button is available if they wanted to keep the buggy moving in a straight direction. They’ve used soft materials to construct this toy. As a result, it’s safe for kids to play with, moreover, if it hits anything, the impact is absorbed. This improves the durability of the toy and protects your furniture. The steering wheel design and size of the remote makes this RC toy great for kids of a younger age. It’s super easy to control and improves their motor skills. The Pixie Crusher Pink and Purple RC Car Toy is an excellent option if you want to let your child take their toy on off-road surfaces. This is possible as a result of the rubber tires that have been fitted. They provide the car toy with a lot of grips, regardless of the terrain. Moreover, they have implemented a suspension system that has a spring-loaded feature. This is incredibly effective at ensuring the car remains stable when going across bumpy surfaces. We were impressed with how it can reach a top speed of up to 5mph. Your little girl can also play with it continuously for up to 45 minutes. All the batteries you need are also provided for both the remote control and the toy car. Girls have been loving the pink and purple design. Vibrant and exciting. Not to mention, there’s a flower design which looks awesome too. We liked how the controls are super easy to use and ensures that your child has complete control over their toy car. It can be moved in all directions for more freedom when playing. Pixie Crusher has taken a unique approach to designing this RC car toy due to how it’s awesome for taking off-roading. You wouldn’t expect this by just taking a look at the bright pink and purple colors! 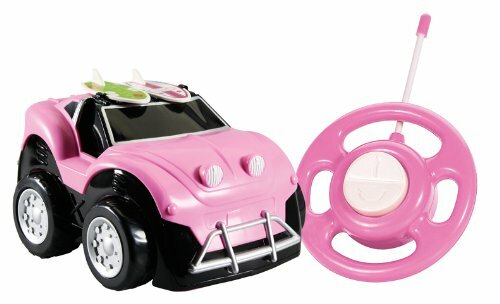 Liberty Imports’ MY First RC Car for Girls has been created with a pink and purple design which girls have been loving. It excited them and is more visually appealing to play with. We liked how the remote control is easy for kids to use. It has a steering wheel design which has been designed specifically for the smaller hands of children. As a result, they have better control over their toy car. By pressing a button, they can make the car spin around 360-degrees, which is a ton of fun! Pressing another button then lets you control the car in a straight movement. Another one of the features that impressed us is how interactive the toy is. The wheels have a light-up feature which is visually stimulating for your child. Moreover, it plays music which is entertaining and great for your child’s audible learning skills. Kids have a blast playing with this RC toy car due to how interactive it is. With the wheels lighting up, music playing, and the ability to switch on the spinning mode, your little one is bound to have a great time with this one for hours! 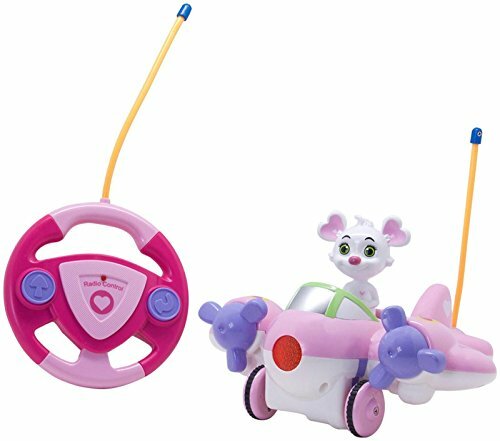 This Disney Mickey & The Roadster Racers RC toy by Jada Toys comes with a super fun spinning feature. You simply press a button on the remote control and watch how the car spins around in circles. Pressing another one of the buttons on the remote then makes the toy go in a straight direction. There’s also a reverse function too. Using the remote is also incredibly easy. As a result, your child can get to grips with how to control their RC car toy and start having plenty of fun. The Mickey & The Roadster characters will also be very familiar for kids. Therefore, they are encouraged to play more imaginatively. The pink design is something that has been very exciting and more appealing for younger girls. We liked how the pink colors they’ve used are bright and create a sense of excitement. 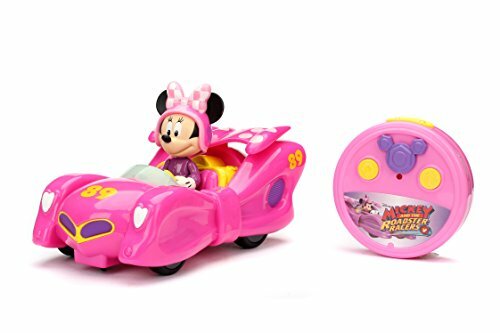 With the spinning feature, bright pink colors, and the Mickey & The Roadster characters, your child will have all they need to stay entertained for a long time. 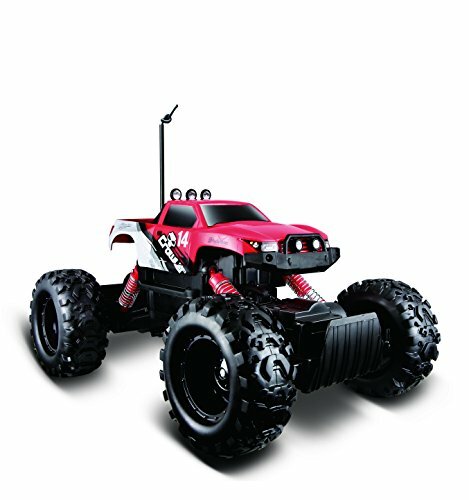 This Maisto RC Rock Crawler toy is available in a variety of colors, however, girls will most likely prefer the pink design. We liked how it has been created with two motors. This provides the toy vehicle with a lot more power for kids to have fun with. There is also a lower gearing system which makes the toy perfect for when it comes to going on off-road surfaces. In addition to this, they’ve fitted articulated suspension at both the front and rear of the toy. As a result, you can expect it to deal with bumps and rough terrain without any hassle. There are even TPE tires which have been specially designed to provide the toy vehicle with extra grip to the road. So, no matter what surface you’re controlling the vehicle over, you’ll be able to do so smoothly. If your child wants an RC toy that they can take off-roading, the suspension, tires, and low gearing system available with this one may warrant a closer look. Jada Toys’ Girlmazing 2012 Ford Mustang Boss RC Toy has been made with a remarkably colorful and bright design. As a result, it’s more appealing to girls and stimulates their visual senses even further. We were impressed with how they’ve also included a sticker sheet with the RC toy too. This is fantastic for enabling your child to personalize their RC toy. The Remote control available lets you have total control over the toy car. Moreover, it’s very responsive which helps kids have a more fun time playing with it. If the bright pink colors weren’t enough to impress your child, the fact that this RC toy car comes with a sticker set will. Kids love adding their own personal touch to their toys, and they’re able to do so with this one. This Hello Kitty RC toy by Jada Toys comes with an awesome Hello Kitty figure. We liked how it can be removed and placed back in the toy vehicle at any stage. It provides children with more playing options that they’ve been having a blast with. They can drive the vehicle around with the Hello Kitty toy inside and remove it once they reach a destination. It’s a powerful way to encourage kids to play more creatively. In addition to the figure, this RC toy also creates sound effects as your child drives it around. These make it more fun to play with and also stimulates your child audible senses. They have also included headlights that light up too. This is another option for kids to play with, it’s also great for their visual learning skills. 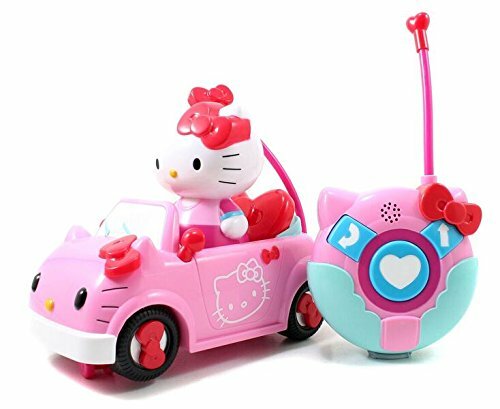 Kids have been having a ton of fun with this Hello Kitty RC toy because they’re able to remove the figure and play with more freedom and imagination. 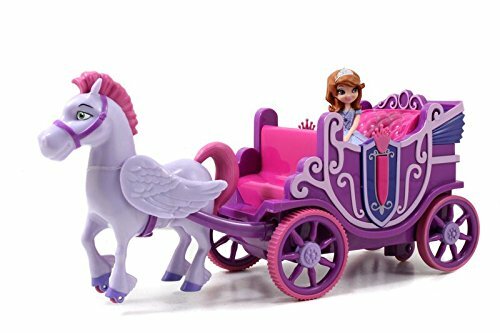 The Sofia Royal Carriage RC vehicle by Jada Toys comes with a super fun spin function. This can be easily turned on by pressing a button. Children have been having a lot of fun with this feature as it adds another element to their play. There is also another button available which you can press to use the RC toy more normally. With this mode, it can move backward and forwards. The design of this toy is incredibly appealing to young girls due to the magical nature. Moreover, we were impressed with how they’ve designed the controller. They’ve made it look like a necklace which can be worn. The design of the remote control is one of the features that young girls have been loving. They can wear it like a necklace and use it to control their toy. This Knolly Nibbles Adventure Plane Vehicle is available in a fantastic pink color. It’s bright and appealing for younger girls. In addition to the bright colors, they have also included some excellent lights. These make the toy more fun to play with and also help your child to develop their visual learning skills. Moreover, this toy creates sounds as you play with it too. The combination of the sounds and lights means your child can play with a highly interactive toy that’s great for their senses. We also liked how the remote control has been designed for younger kids. As a result, you can expect your child to get to grips with the controls in no time. The lighting and sounds effects available makes this RC toy remarkably interactive and more fun for kids to play with. With a remote that’s easy to use, your child will be spending plenty of hours playing with this one. 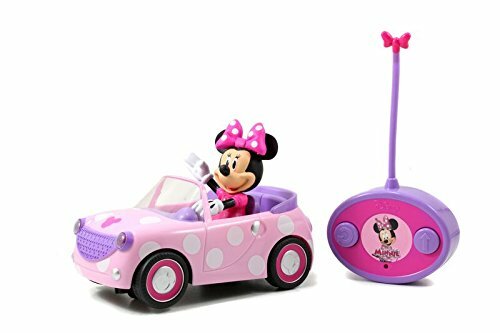 This Minnie Mouse themed RC toy by Jada Toys has a fun spin function available. It can be activated by pressing a button on the remote and kids have been having a blast with it. They’re also given the option to use the RC toy in forwards and backward movements by pressing another button. The controller has an infrared system which makes it incredibly responsive. As a result, your child is less likely to get frustrated and, instead, have a fun time. Moreover, the controller itself is very easy to use to minimize any frustration. We liked how they’ve designed the toy with a pink dotted design. It gives off a sense of fun and gets kids excited to play with it. Furthermore, the Minnie Mouse character is one that many kids love which makes the toy even more fun to play with. This character being in the front seat is also a good way to help your child play with more imagination. 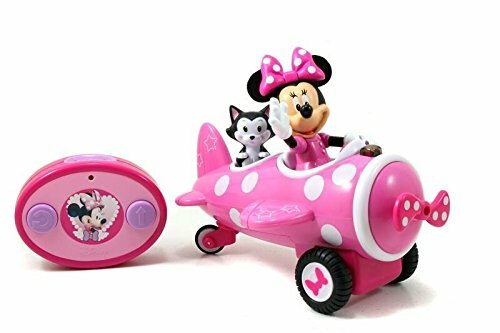 The spin function, bright pink design, and Minnie Mouse character are all elements that come together to make this toy incredibly fun for kids to spend hours playing with. 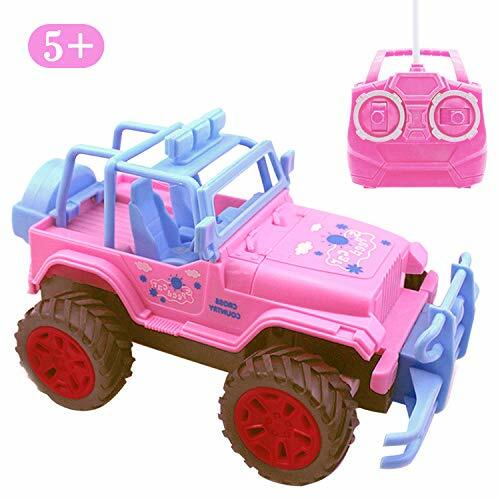 This RC Jeep Truck Toy from Blooming Lilies is available in an awesome pink color. This makes it very attractive to girls and provides them with a unique toy. We were impressed with how they’ve designed the control to be specially made for younger kids. As a result, the size is smaller and perfect for children. This makes it much easier for them to control their toy car and have a blast. It’s also an excellent way for kids to work on their motor skills too. They have the freedom to move the RC toy car around in all directions. It can be used on carpets, tile, and concrete surfaces to get the best performance. The design of the control and ability to move the RC toy around in all directions allows kids to have a ton of fun with this one. It’s also effective in helping to improve their motor skills. 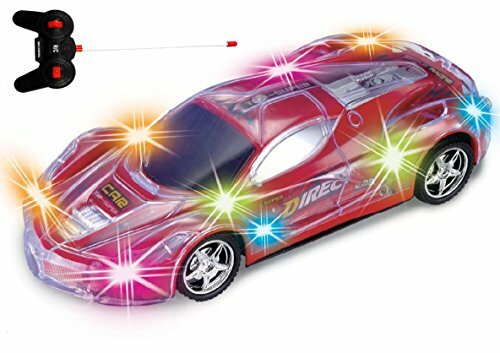 The Haktoys RC Sportscar has a super fun LED light up feature. These are bright and fun for kids to watch as they play with the car. Not to mention, it’s also an excellent way for kids to develop their visual learning skills too. We liked how the controller available is easy to use and ensures kids are able to have total control over their RC car toy. Furthermore, they’re given plenty of playing freedom as they can turn the car in all directions. You’re able to control the car when standing up to 100 feet away. 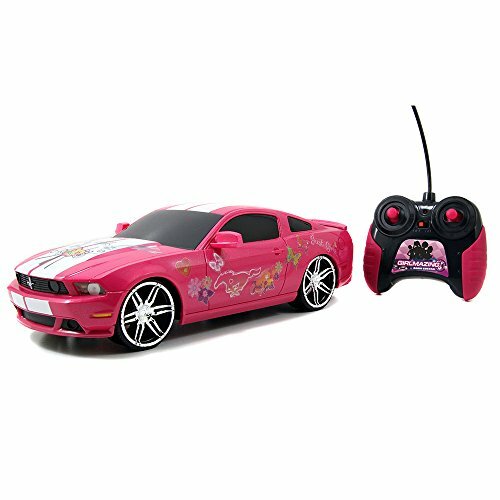 This car is sure to be one of the best Remote Control Cars for girls. The light-up feature available with this car adds another element of fun for your kids. With a controller that’s easy to use and the ability to move the toy car in all directions, they’ll have a super fun time playing for hours. Above you’ve been given 16 great options to help you find the right girls radio controlled car. However, if you’re still feeling unsure as to which one is best for your child, you’ll want to check out the section below. 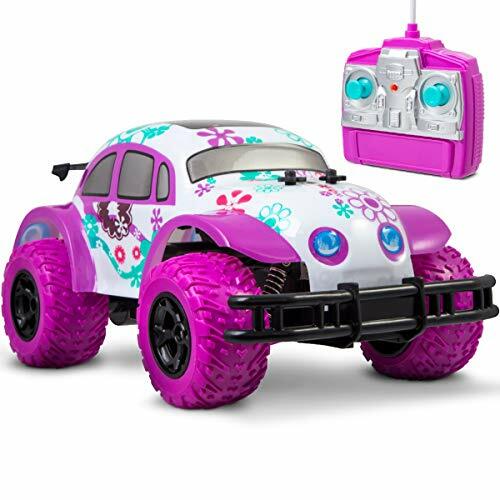 We’ve detailed the best types of RC vehicle toys for girls, the important factors to consider, as well as the other types of RC toys available on the market. Ensuring that you’ve picked a girls remote car in a color that your child likes is crucial. There are different colors available for these types of toys, so, be sure that you’ve consulted with them about their favorite colors. 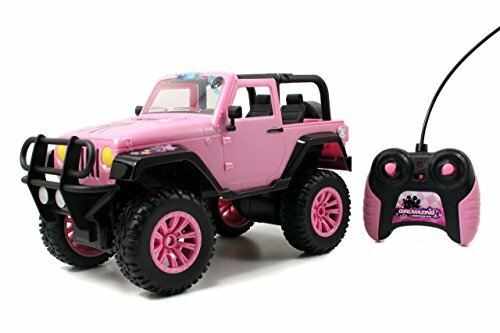 In our list above, you can find pink remote control trucks, cars, and jeeps. Most girls absolutely love pink RC cars and other vehicles, in fact it’s the predominant color of the most popular remote control toys for girls and that’s why we’ve included a bunch of pink ones in our guide of the above. Girls also love purple toys and cars are not different when it comes to this. Usually it’s just a little touch of a girly design with this girly purple color that makes your little one love it. Of course there’s nothing wrong with pink or purple if it’s the color your boy wants and loves. While red isn’t the most popular girls can and do love it along with many other colors. If your daughter is unique and bucks the trend on typical ‘girly’ stuff she may actually love an RC car that is considered to be one that boys would love. Playing with RC cars may just seem like entertainment, and while that is true, there’s a lot more going on in the brain of your child than you may realize. Since kids are playing with a remote control, they’re pressing different buttons and moving things around which is great for developing their motor skills. Moreover, since they’re controlling an RC car, your child will have to recruit their coordination and spatial awareness abilities too. Both of these developments are incredibly effective at ensuring your child is able to improve their cognitive function over the years. As you can see by our review, there are different kinds of RC vehicles for girls. They can vary from more regular cars to slightly larger ones, such as Jeeps. So, to learn more about what distinguishes these vehicles from one another, have a quick read of this section. We’ve included a few standard RC cars in this review as they can still be a lot of fun for kids. They have great controls and enable kids to drive the car around as though they’re driving it in real life. RC vehicles that have a spinning function provide kids with more entertaining options to play with. They’re easy to use as all you have to do is press a button to activate the spinning mode. To set it back to the normal RC playing mode, you simply press another button. There are a few RC cars in our review that come with a sticker set. Girls love using these stickers to decorate their toy cars with as it gives them the means to add a personal touch to it. It’s also super fun for them to pull out the sticker book and get designing. Character-themed RC cars may be worth considering if your child loves a certain TV show with the character. For example, there are Minnie Mouse and My Little Pony RC vehicles in the review above. If your child is familiar with those characters, they’ll love playing with them. It’s an awesome way for them to play with more imagination too. As if playing with an RC car alone wasn’t fun enough, kids are able to have even more fun while playing with the ones that have lights and sounds available. They add a more fun element to your child’s playtime and they’re also awesome for developing their visual and audible learning skills. There are other types of RC toys for girls available that you may also be interested to learn about too. They may be better than cars depending on what your child wants. RC trucks for girls are among the largest of remote control vehicles around. Many of them are great for fitting multiple figures inside which kids love playing with. They can drive the truck around with the passengers inside and take the toys out to play with more creativity. The trucks are also better for driving across rougher terrain. Their wheels are larger and the suspension available is effective at minimizing any bumps. RC Jeeps are pretty similar to the cars, however, they tend to be large in size. Furthermore, these remote control vehicles tend to be better at performing on off-road conditions. This is mostly because of the larger tires and better suspension systems that they’re fitted with. Remote control helicopters for girls are a ton of fun and enable kids to play in more creative ways. If your child already has an interest in helicopters, playing with an RC version of them could be just what they’ve been wanting. 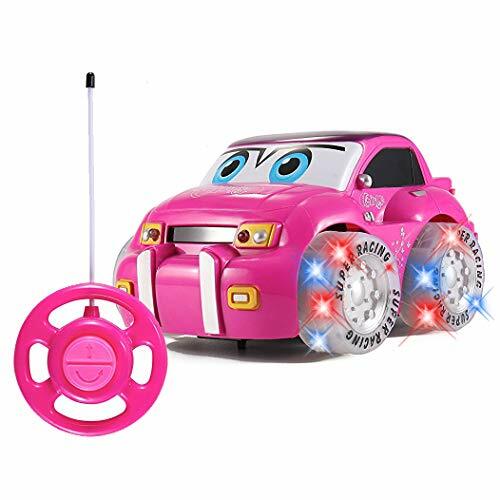 Now that you know more about what the best girls remote control cars have to offer, you can be sure to find the one that suits your little girl the best. To help make the narrowing down process even easier, use our buyers guide section just above. We’ve outlined some of the main factors to consider, as well as the different kinds of RC vehicles available. Any one of the cars in our review will be bound to have your child occupied and having a blast for hours!